MEMORIAL COLISEUM, LOS ANGELES, CALIFORNIA, 27 SEPTIEMBRE 1985. Grabado por Toby Scott﻿. Mezclado por Jon Altschiller. El Coliseo Memorial de Los Ángeles, sede de dos Juegos Olímpicos, proporciona un escenario apropiado para la última parte de la gira Born In The U.S.A. Es la noche inaugural de los últimos cuatro shows de la gira, frente a 83,000 fans. Bruce y The E Street Band alcanzaron su cenit en el estadio con una poderosa actuación que combina temas ya antes interpretados en la gira como "Seeds", "Atlantic City", "Working on the Highway, "" Going 'Down "," Glory Days "," Trapped "," Dancing in the Dark "y" Downbound Train "con estrenos mundiales de" War "de Edwin Starr y la maravillosa cara B "Janey, Don't You Lose Heart". 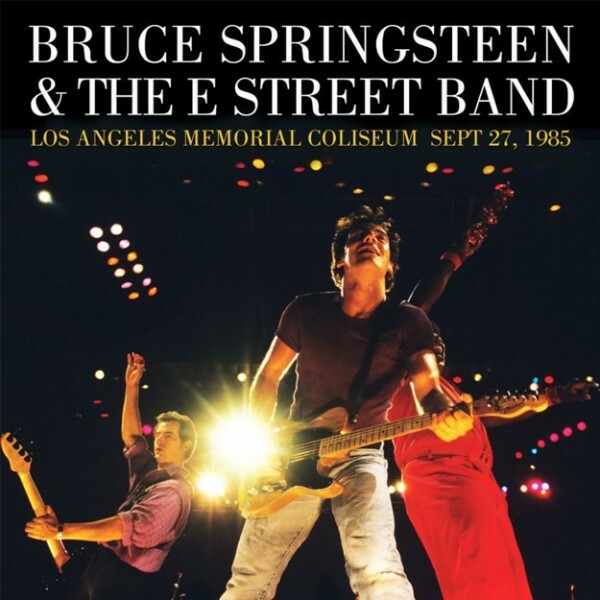 Memorial Coliseum, Los Angeles, 1985 represents the apex of Bruce Springsteen’s mass popularity. No concerts performed before or since represent the same level of mainstream cultural impact inherent in the final four performances that wrapped the mammoth Born in the U.S.A. tour. According to the LA Times, on September 27, opening night of the sold-out stand, Bruce and the band played to 83,000 people. That means over the course of four sold-out shows, more than 330,000 people clicked the turnstiles at the site of two Olympic Games, to see not world-class athletes but the world’s greatest live performer. Staggering. Springsteen long factored for the person in the very last row at his concerts, but now that fan was 100-150 yards from the stage. Scaling up production elements at stadiums to deliver a comparable level of band-to-fan connection was crucial, and that affected everything from the sound of Max’s drums and the quality and size of the stage-side video screens to the clothing the band wore on stage, which was brightly colored to help boost the visibility and discernibility of individual members from far away. Los Angeles 1985 starts as it must with a dazzling “Born in the U.S.A.” Jon Altschiller’s zoomed-in mix (with a notably livelier audience levels) dials in a difficult-to-achieve balance of synthesizer and guitar. The deepest notes of the former provide a sternum-compressing whoosh that anyone who saw a BIUSA stadium show will remember; the latter more forward and clearer than we often hear on 1985 recordings. 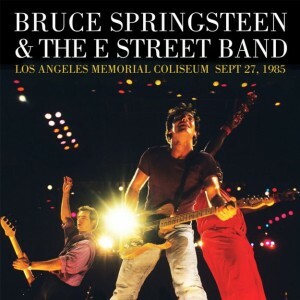 As Bruce sings, “long gone daddy in the U.S.A.,” we get some real chugga chugga licks, followed later by an extended solo that’s up there with the great ones that append the song on the 1988 Tunnel of Love tour. As for Max Weinberg, he absolutely crushes one of the best live versions of “Born in the U.S.A.” ever released. At this point of the 1984-85 tour, the E Street Band was a machine in the best sense of that word, operating under both Bruce’s and the individual players’ master control. The transition from “U.S.A.” to “Badlands” is lush with Danny Federici organ swirls, and we can hear every band member in sharp detail right down to Clarence Clemons’ percussion. But the E Street MVP this night is Nils Lofgren. LA 1985 is an opportunity for reappreciation of how much of the load he carried on the tour and the many spots when he shined. His intro to “Seeds” oozes dirtier than you might recall, and the hypnotic prelude to “I’m on Fire” alters the tone of the song significantly. As Nils plays, Springsteen’s spoken introduction to “I’m on Fire” (omitted on Live/1975-85) subtly shifts the song’s narrative, too. He speaks of the struggles endured by his father and mother, and of his fear that, if he didn’t get out, whatever sense of hope and happiness was figuratively dying inside his dad would be his fate as well. Lying awake in bed, thinking dark thoughts like one of the characters he wrote about on Nebraska, the narrator confesses he understands how one could snap. It makes the “Hey little girl is your daddy home” that follows more of a disturbing dream. The bulk of LA 1985 is made up of what might be called a refined stadium setlist, optimized for maximum impact in venues of this scale. Over the last 34 years, so-called stadium friendly material suggested something that couldn’t compare to the greatest theater and arena performances that preceded it. Yet listening today, one marvels at how skillfully the band is playing in front of 83,000, not merely showing themselves up to the task of reaching that distant back row but retaining the tightness, power, and nuance that made them the best live act in the world. In other words, don’t sleep on ‘85. Stadium staples aside, let’s not overlook the second of the night’s world premieres. “Alright, let’s try it” serves as the rallying cry to the live debut of “Janey, Don’t You Lose Heart,” the charming Born in the U.S.A. outtake and “I’m Goin’ Down” b-side that is a kindred spirit to another equally enchanting leftover, “Be True.” Both share a certain mid-tempo melodic romanticism that marks a lot of the songs Bruce often left on the cutting room floor. It’s a winning version that curiously omits The Big Man’s recorded sax solo in favor of piano solo by The Professor. Listen for Bruce hooting encouragement and howling with glee as Roy takes the spotlight. He clearly likes Janey. The show wraps fittingly with a cover of Creedence Clearwater Revival’s “Travelin’ Band,” resplendent with Clarence’s baritone sax, Roy’s piano fills, and nearly a dozen tour-stop namechecks. It’s the perfect selection for the end of the line, recalling the mystery train that left the station at a St. Paul arena 15 months earlier and wound up conquering the world by the time it came to a halt in LA, playing to an audience more than five times the size.